Applicable policies in Employee Handbook Creator are updated to reflect recent legislative and regulatory changes, agency decisions, court cases or best practices. Additionally, the online tool includes paid sick leave and other policies that comply with local ordinances for certain California cities. See 2019 Compliance Alert below for more information. Subscribe for your first year of access and then renew at $99.99 (at $178.98 for English and Spanish kit). Pay a lower price at renewal time. Time to renew? Sign in now! "Don’t hesitate to start from scratch. 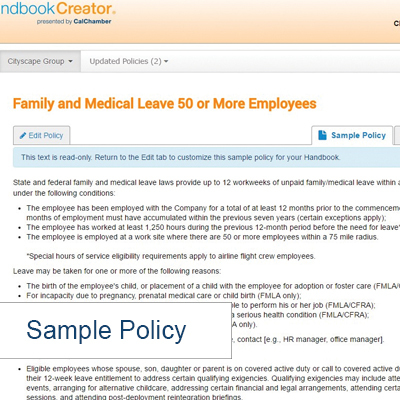 Employee Handbook Creator is easy to use, with precise wording that’s so important these days." Kat Lotz, CFO Jewel Box Platinum, Inc.
Who knew creating an employee handbook could be so easy? 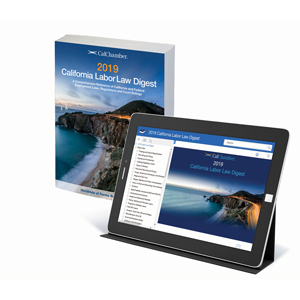 Creating and maintaining a well-crafted employee handbook that complies with state and federal laws helps protect California employers from lawsuits. Think of it as a user manual for the workplace. 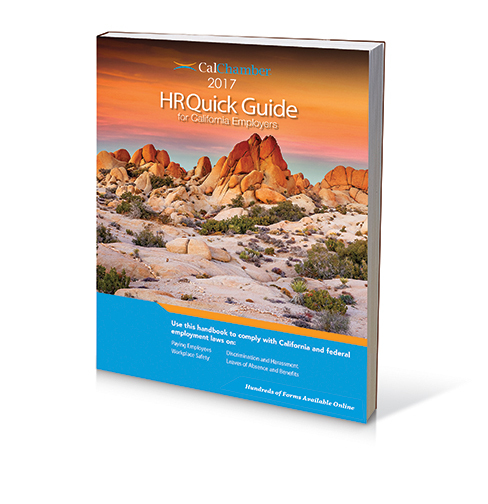 CalChamber's Employee Handbook Creator tool guides you through every step of what is usually a complicated HR task. Conveniently access the Windows/Mac-compatible tool from your desktop or tablet. Through a yearly subscription, use the Employee Handbook Creator to clearly communicate company policies and set expectations—in an employee handbook you create online and then export to print from your own printer. Access more than 120 policies, including policies that may be required, recommended or optional for your company—such as the required EEO policy and policies required by local ordinances. Your yearly subscription helps keep your handbook policies up to date. 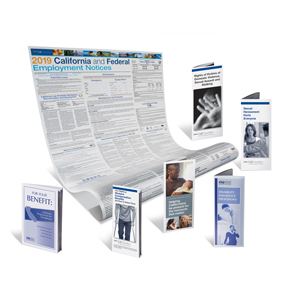 Renewing your subscription each year at $99.99 (English or Spanish) means you'll continue to receive new and revised policy updates resulting from changes to California and federal employment laws or regulations. 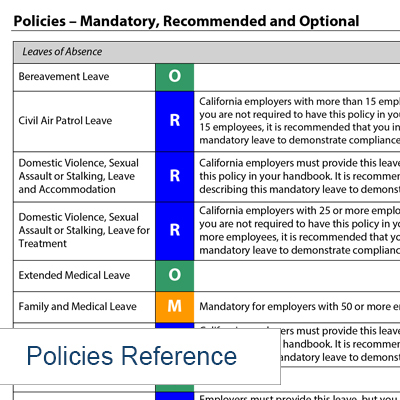 You not only receive email notifications on policy updates throughout your subscription year, but the Employee Handbook Creator makes it simple to revise your handbook online. Check out CalChamber’s free “Top 10 Employee Handbook Mistakes” white paper for members or nonmembers. (Recommended) Organ and Bone Marrow Donor Leave: Includes reference to 90-day waiting period for employee eligibility. (Mandatory) San Francisco Lactation Accommodation: Revised to address San Francisco’s Rules Implementing the Lactation in the Workplace Ordinance. Additionally, several policies were revised to omit references to "he/she" and "him/her," making language gender neutral, which you can choose to insert at your discretion. An employee handbook is one of the best ways to avoid misunderstandings and ensure fair, consistent treatment of employees. Creating a handbook that complies with California and federal laws informs employees and helps protect your business from lawsuits. 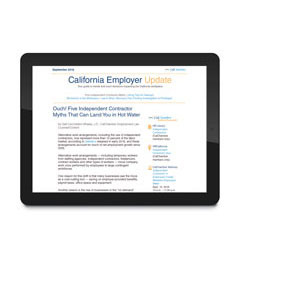 Use CalChamber’s Employee Handbook Creator tool to clearly communicate company policies and set expectations in an employee handbook you create online. The online tool is both Windows and Mac compatible, plus you can conveniently access it from your desktop or tablet. 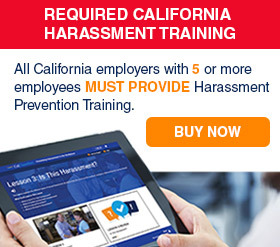 Subscribe to California Employee Handbook Creator separately for the English or Spanish version. Save $50 when you order them both as a kit. (Instructions, explanations, navigation and the wizard are in English for both versions.) Your subscription is good for one year from when your access starts. When you receive your yearly renewal notice, you pay only $99.99 to renew a single English or Spanish version for one year; $178.98 for both English and Spanish versions in one kit. CalChamber Preferred and Executive members also receive their 20% discount. Questions about renewing? Call (800) 331-8877. Note: While you can access content for your handbook online anytime, the handbook itself is not stored online. So it’s important to export and save all handbook versions you create. If you ever make updates to your handbook through Employee Handbook Creator (including changes resulting from updated policy notifications), the new version replaces the previous version online. 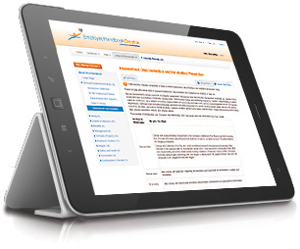 Access the Employee Handbook Creator online tool from desktop or tablet (PC/Mac compatible). Comprehensive wizard simplifies building your handbook and identifying mandatory policies. Answer the wizard's series of comprehensive questions to determine what you need and want in your handbook. Select from more than 110 company policies, including policies that may be required, recommended or optional for your company. (Option) Print a copy of the wizard questions and your answers. Helpful explanations clarify wizard questions. Stop and start anytime (tracks your progress). Help menu includes FAQs and How To's. Customize handbook with your logo and company-specific content—including adding your own custom policies. Copy and paste company-specific text from a previous handbook. Export your completed handbook as a PDF, RTF or HTML and then print the file from your own printer. Email notifications indicate employment law or regulation changes affecting your handbook. Revise online as needed and export the new version to your PC or Mac at any time. Why doesn’t Employee Handbook Creator have English and Spanish languages within the same tool? To lower your cost, we offer English and Spanish versions separately so you can subscribe to the version you need. (Instructions, explanations, navigation and the wizard are in English for both versions of Employee Handbook Creator online tool.) Save $50 if you subscribe to a kit with both versions. Why would I need a Spanish version of the handbook? California has a large Spanish-speaking workforce, and communicating your policies to employees is important. In some cases, such as anti-harassment policies, the failure to communicate the policy in the language that your employees speak may increase your risk of liability in the event of a lawsuit. An employee handbook gives you the best opportunity to clearly communicate your company policies and help protect yourself from unlawful termination suits. If I have an existing policy or want to add information to a policy in the online tool, will it translate it into Spanish? No. However, if you are a CalChamber member, you’re eligible for a free initial consultation and a 15% discount on translation from SpanishOne, made available through our business partner service. What if I need more than one handbook? If you would like to add a new handbook for a different company, you will need to buy another subscription. Can I post it to our intranet? Can I personalize it with our company logo? Do you have technical support if I need assistance? Yes. You can call (800) 700-4044 or email techsupport@calchamber.com. Am I required to have an employee handbook? California does not require employers to have a handbook. However, if you create a handbook, there are policies that must be included. The Handbook Creator Online Tool is one of the best HR resources. It has allowed me to keep my handbook up-to-date with ease and peace-of-mind.